I've always wanted to build on of those, ASW or transport version. Wow! You could spray Luxembourg in a single pass!! is this bigger or smaller than the 48 scale b1b? Depends on how you define "bigger"....If I have the math right (always questionable ), the span of the 1/72 B-36 is greater than the (unswept) span of the 1/48 B-1B. The B-1 is longer. Both kits are huge. I have not seen the B-1 kit up close. A friend had/built one (Revell 1:48 B-1B) many years ago - (really) HUGE thing, and the only option to stow it somewhere was to hang it upside down under the ceiling. Beware! got at least three of those monsters in my stash.....................................Ive no idea why, as ive got no where to put one built up let alone three. They're moulded so you can plug the wings in and out without glue. A bit like a carrier aircraft, you can almost fold it up. Indeed. 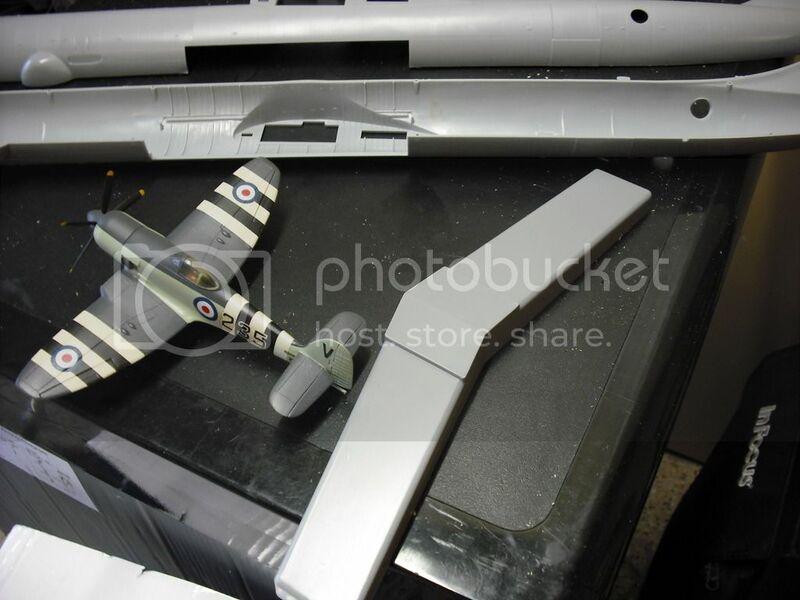 Most aircraft kits have a wimpy tag to insert the wing into a fuselage slot, no such deal with this kit! 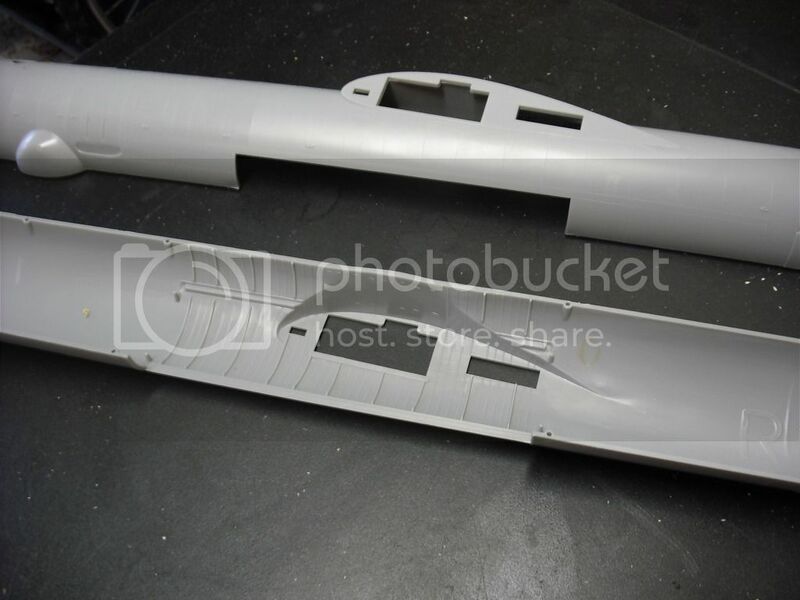 Here is the central wing spar section that goes through the fuselage and you slip both wings onto! Work has begun. The kit is a RB-36 with the short bomb bay, but I desire the long bomb bay, bomber version, with the two long bomb bays. Will need to scratch up a bit of the bomb bay interior, and rescribe some bomb bay doors. Luckily the lumps and bumps and aerials of the RB version are add-ons, so just leaving them off gets you closer to the bomber versions. Here you can see the "short" bomb bay that opened beneath bomb bays #2 and #3. On most RB versions, bomb bay #1 was changed into a pressurized camera compartment, and #4 was used to mount radomes and hold other recon gear. I have debated painting the entire plane more typical, vibrant, crop duster colors, but think the two tone magnesium and aluminum fits the backstory better. At least have some brite yellow wingtips and panels! Please! A very Big Aircraft Cool. Already I'm impressed! I remember the noise they made as they filled the sky in the 50s. Oooh this is insane, what a great idea! Also I LOVE the Sea Fury! I've got a mental image of a B-36 Fire bomber coming directly towards me across the surface of a lake filling its tanks. It's a very pleasing image.